← Just 7 weeks to have your say on the short tunnel! To the east: Twin tunnel portals would sit just north of the present A303 and within the barrow cemetery east of King Barrow Ridge. Even more critical is the portals’ proximity to traces of the ancient Avenue, a major feature of a designed landscape, leading from the Henge to the River Avon. Already severed by the present A303, the Avenue’s integrity and setting would be shockingly degraded close by the tunnel entrances. Engineering works, noise from faster traffic, the flyover at Countess and, possibly, new embankments (ill-defined on the video) could be catastrophic for the Mesolithic site of Blick Mead beside the A303. To the west: Tunnel portals would sit just south of Normanton Gorse wood – on the alignment between Stonehenge and the winter solsticial sunset: an extraordinarily inappropriate location in view of the known astronomical associations of Stonehenge. Furthermore, the portals would be cut at the western end of the Normanton Down barrow cemetery, of which Bush Barrow is a part, famous for its gold artefacts. The woodland of Normanton Gorse, like that of The Diamond further west which would be cut through by the new road, contains important archaeological remains hitherto protected from the plough. The dualled highway, in a cutting, would emerge from the western portals to cross a tract containing multiple traces of archaeological remains, most significant among them a rare group of seven Neolithic long barrows. These barrows, respected by later Bronze Age cemeteries, were deliberately located around the head of the dry valley through which the new expressway would be gouged – in places close to barrows. The shaping of the landscape and inter-connectivity of the monuments is one of the attributes of the Outstanding Universal Value of the WHS. All archaeology in the path of the new highway would be removed. 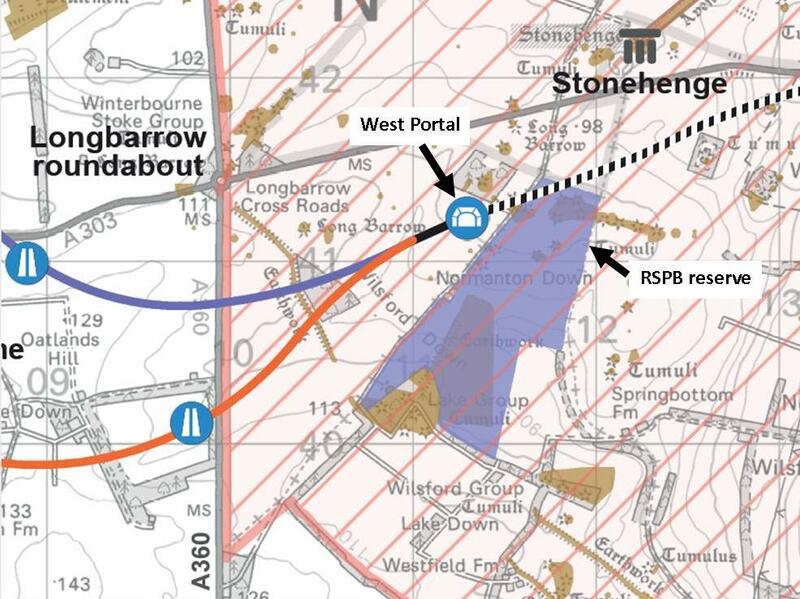 The western tunnel portals and highway would certainly impact adversely on the RSPB’s Stone Curlew reserve beside Byway 12 (area marked purple). The tranquillity and environment of this important breeding ground would be greatly disturbed, both during construction work (approximately 4 years) and afterwards: so much so, perhaps, that the reserve would no longer be viable. Little is known about bat roosts and feeding grounds in the woodlands affected by the engineering works, though protected species are known close to Amesbury. Bats can be disturbed during road construction and by vehicle noise and speed. The River Avon on the eastern boundary of the WHS and its tributary the River Till, to the west of the WHS, are legally protected as Special Areas of Conservation for aquatic plants and snails. There must be concerns about their safeguarding from the impacts of major engineering works and the effects of vehicle pollution in the longer term. Not seen on the maps, visuals and elegant videos are details such as lighting, fencing and signage. Nor do the illustrations reveal how wide the highways, tunnel approaches and portals would be. Even in road cuttings, vehicle headlights, noise and fumes would be intrusive and pollutiing, particularly unwelcome in the western part of the WHS which at present is both tranquil and beautiful along Byway 12. Drainage treatment areas and construction compounds are not shown. Images of road building at Hindhead and Newbury give some idea of the devastation involved during road construction activity. 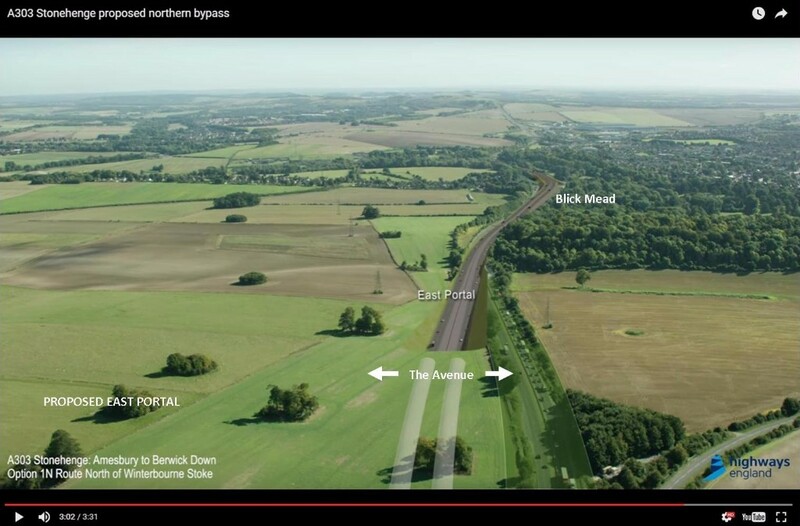 Implementation of a tunnel scheme at Stonehenge and loss of the drivers’ view also has, of course, implications for Avebury – part of the same WHS – which might well suffer from increased tourism and traffic and the potential loss of World Heritage status. 1. 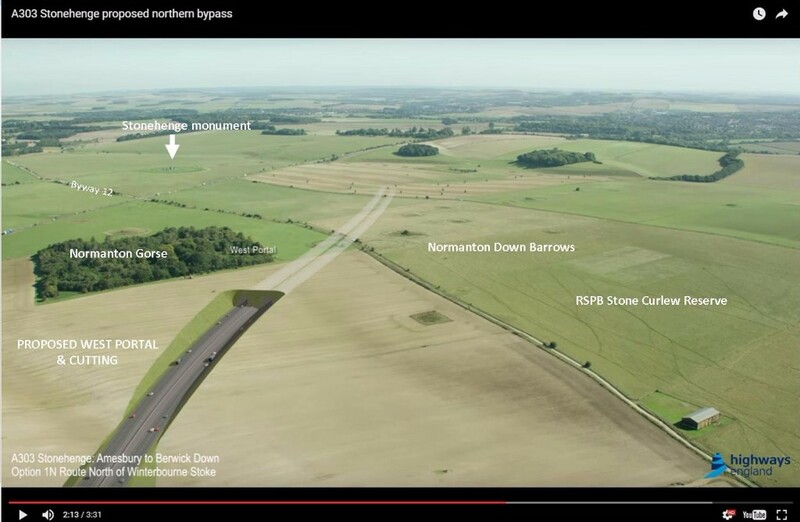 Please respond to the A303 Stonehenge consultation here by 5 March 2017. 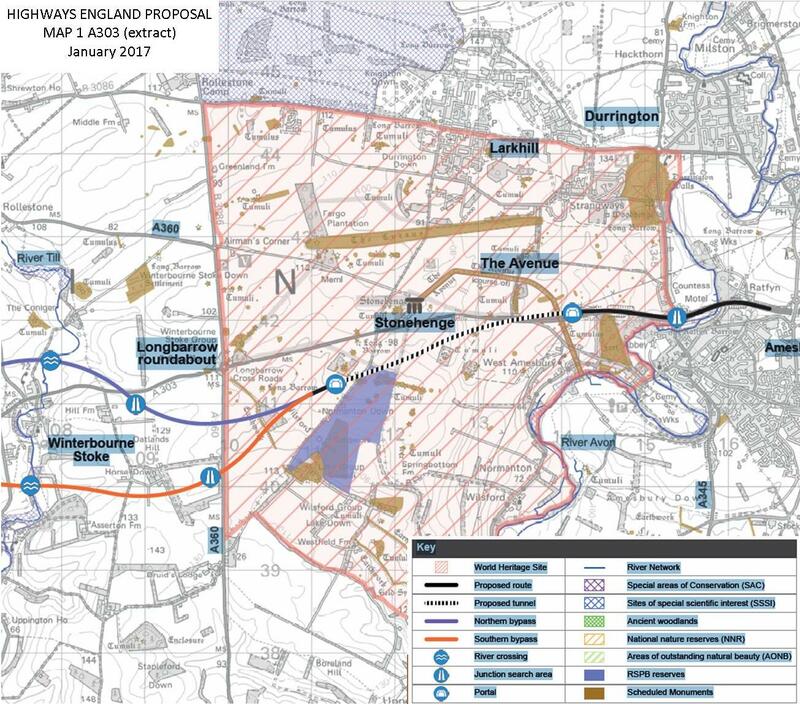 For further information, maps and documentation see Highways England’s consultation page here. 2. If you haven’t already done so, please, sign our petition and encourage your friends to do the same. KINDLY NOTE: Since setting up the petition, we have learned more about the recently discovered Mesolithic site at Blick Mead. This has led us to consider that if Government insists on a tunnel under the WHS, it must be long enough to avoid the WHS and its setting altogether. This would be in line with planning policy and World Heritage Convention safeguards. We cannot change the wording but our intention to avoid further damage is clearly stated in the petition. Please write to UNESCO and, if possible, to the National Trust as well, expressing your concerns. Editing your responses in your own words will be more effective. Follow our campaign on Facebook, Twitter and our blog.